The Macadamia Nut Butter Crisps combine the thin, crispy, and slightly chewy Swedish butter crisps with a macadamia nut cookies. These cookies are addictive! Don’t say I didn’t warn you! My mother moved to Maui. Like packed up and moved from the Philly area off the mainland to Maui. Like, two day trip moved to Maui. But, I have to explain something to ya. Mom and I? Well, we hadn’t been getting long for a few years before she moved off the mainland. Things were said, things were done, and feelings were hurt. You know how it goes sometimes. But before she moved off the mainland, she reached out to me to make amends and rebuild a relationship that was broken. I can’t tell you how – happy just isn’t the right word for it. It’s like it healed a part of me that was broken. Fast forward a couple of years and she was here for a visit. And it was awesome. And we had a blast making macarons both sweet and savory and seeing an excellent art exhibit. I think that’s what I missed the most; having someone to go see an art exhibit with. Any takers wanna ditch work and see some with me? And while she was here, she shared some of the deliciousness that she has found while living in Maui; macadamia nuts, of course, and coffee. And some cookies. These macadamia nut crisp cookies that were delicious and buttery. Since we’re both bakers and I’m always trying to recreate, she asked me to recreate these cookies. Sorry, Mom. It’s taken me a little over a year, but my mixer was broken. That little, pesky, worm wheel busted while making some sourdough pizza dough. Yeah, it was a little stiff and wedged the paddle and that’s how it got busted. But, my friend Google told me that I could order a replacement and my other BFF YouTube showed me how to take my mixer apart and replace that little wheel. So I did, but it broke again while making these cookies. Are you kidding me?!?!?!? So, ordered a new part and purchased the whole worm wheel housing. After taking it apart once, I remembered how to take it apart and replace the worm wheel housing, clean up all the little broken bits that might get jammed, and then put it all back together. All the while, cleaning the little bits of dried stuffs that has gotten into the crannies that I didn’t know I could clean. It’s all shiny and sparkly now!! And works beautifully! Love it! Now, back to these cookies. 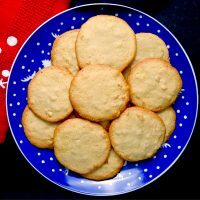 After repairing it again, I made a second batch and totally nailed recreating these delicious little butter macadamia nut cookies for Mom. And, not only are they for Mom, but it’s an homage to our roots! They’re based on a Swedish style thin and crispy butter cookie. And, yup, Mom’s roots are Swedish! And Norwegian which is why I love winter over summer hands down! I did a lot of research in trying to figure out exactly what type of cookies these are based on. I searched butter cookies far and wide; crisps, German, Swedish. The only one that truly did capture the flavors and textures of the cookie Mom brought was a Swedish butter cookie. They’re crisp on the edge and have a slightly chewy center. And they are PACKED FULL of macadamia nut flavor that just sings in this cookie! That’s really the only way to describe it. You get the hint of vanilla, the fleck of salt, and tickle of cinnamon, but the main chorus is macadamia nuts through and through. And they’re like your fave song, because you just can’t hear it once. You put it on repeat and eat a couple of them then a few more then you realize you’ve eaten the whole pan. Or is that just me? So, while these aren’t a family favorite or an heirloom recipe, it will be from now on. Not only do I love them, but the hubs does, too. That means that I’ll be making them repeatedly, which is fine with me because they’re full of amazing flavor. What’s your favorite cookie? Do you have heirloom recipes you enjoy making every year? The #SundaySupper crew have put together a HUGE list of cookies for your holiday baking. Following the Pinterest board ensures that you don’t miss a single recipe added from #SundaySupper members. The Macadamia Nut Butter Crisps combine the thin, crispy, and slightly chewy Swedish butter crisps with a macadamia nut cookies. These cookies are addictive! Don't say I didn't warn you! In the bowl of a stand mixer with a whisk attachment, combine the sugars with the butter in a mixing bowl. Beat until creamy and light. Add in the eggs beating after each addition. Change to the paddle attachment. Combine the flour with the cinnamon and salt in a small mixing bowl. Add the flour mixture to the butter mixture until incorporated. Pour the macadamia nuts into the bowl and stir a few seconds or until they are mixed in. Using a tablespoon scoop or two tablespoons, drop the cookies in a baking sheet lined with parchment or with a silpat. Bake at 325 for 12 to 15 minutes or until lightly brown around the edges. Remove from heat and cool in the pan 5 minutes before moving to a wire rack to cool completely. You just reminded me how much I LOVE macadamias. I am going to have to go get some now. And then again, after I bake them up! I could never forget how much I love them! And Mom always brings me a can fresh from Maui. I hope you enjoy them! I love macadamia nuts and white chocolate- I will def. pin this for the cookies this year! Thanks! I hope you make them because they are DE-licious! I think I would break down in tears if my mixer broke! Glad it’s fixed (again). These cookies look like my kind, too. Crispy edges. Yum. Yeah, I kind of did. LOL Thank you! They were crispy on the edge and nice and chewy in the middle! These cookies look wonderful and are a great tribute to your Mom’s heritage and her new home. These look so crispy and delicious. I love, love macadamia nuts and really want to try these!! Thank you, Nicole. I hope you do, but I warn you! They’re addictive! Love the crunchy edges and soft centers! Looking forward to trying these for sure!! I was aiming for the crispy edges. They came out perfectly! I hope you enjoy them. They truly were delicious. So glad you reconnected with your mom! And that you recreated these marvelous cookies!! They sound spectacular!!! Thank you. They are delicious, Liz! I hope you try them.